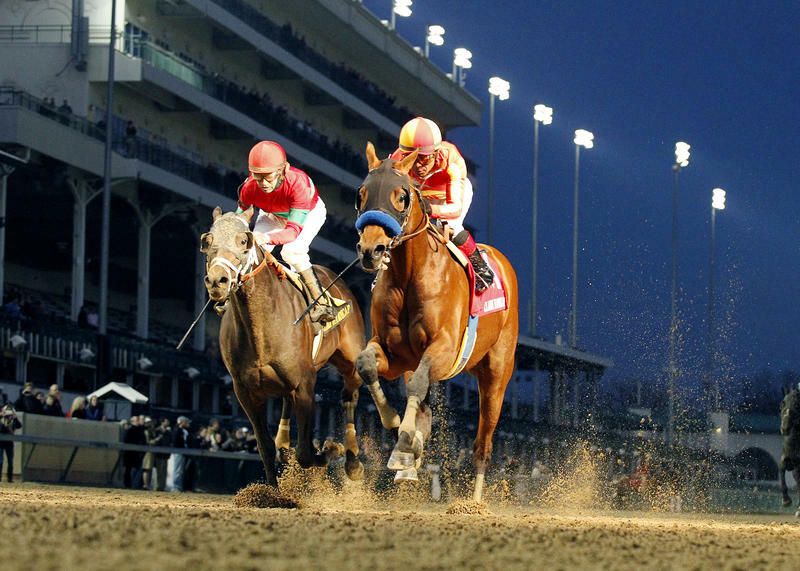 The Bob Baffert-trained Hoppertunity (right) won the 2014 Clark Handicap (GI) under jockey Martin Garcia, and the team will attempt to win the race for the second consecutive year on the "Black Friday" program at Churchill Downs (Reed Palmer, Churchill Downs). Donegal Racing’s Travers Stakes (GI) winner Keen Ice, the only horse to defeat Kentucky Derby Presented by Yum! Brands (Grade I) winner American Pharoah during the latter’s historic Triple Crown season, will attempt to complete his 3-year-old campaign on a high note when he takes on eight rivals in the 142nd running of the $500,000 Clark Handicap Presented by Norton Healthcare (GI), the main event on the traditional high-quality “Black Friday” racing program on the day after Thanksgiving at Churchill Downs Racetrack. The Clark Handicap shares its distinguished history with the Kentucky Derby, Longines Kentucky Oaks (GI) and the Falls City Handicap (GII), all of which were introduced during the inaugural July 1875 race meet at the Louisville Jockey Club, which would later become known as Churchill Downs. The Derby, Oaks and the Clark have been run annually without interruption since their respective first runnings, and the Falls City is set for its centennial running on Thanksgiving Day. The Clark, a 1 1/8-mile race of 3-year-olds and up, is the main event on the 12-race post-Thanksgiving racing feast on Friday, Nov. 27 that also features the $100,000 Commonwealth Turf (GIII) for 3-year-olds on the Matt Winn Turf Course and the $80,000-added Dream Supreme Overnight Stakes for fillies and mares ages 3 & up at six furlongs. First post for the “Black Friday” racing spectacular is set for 12:40 p.m. (all times EST). The Clark, named for the family of Churchill Downs founder Meriwether Lewis Clark, is scheduled as the 11th race with a post time of 5:35 p.m. The 3-year-old Keen Ice faces an accomplished group of older Clark Handicap rivals that include Tri-Bone Stables’ improving veteran Effinex, runner-up to American Pharoah in the $5 million Breeders’ Cup Classic (GI) at Keeneland; Mike Pegram, Karl Watson and Paul Weitman’s defending Clark winner Hoppertunity; the Todd Pletcher-trained duo of Matthew Schera’s Race Day, winner of Keeneland’s Fayette (GII), and Sumaya U.S. Stable’s 2014 Clark Handicap runner-up Protonico; and G. Watts Humphrey’s Frivolous, a 5-year-old mare who will attempt to become the 10th member of her gender to defeat males in the Clark. 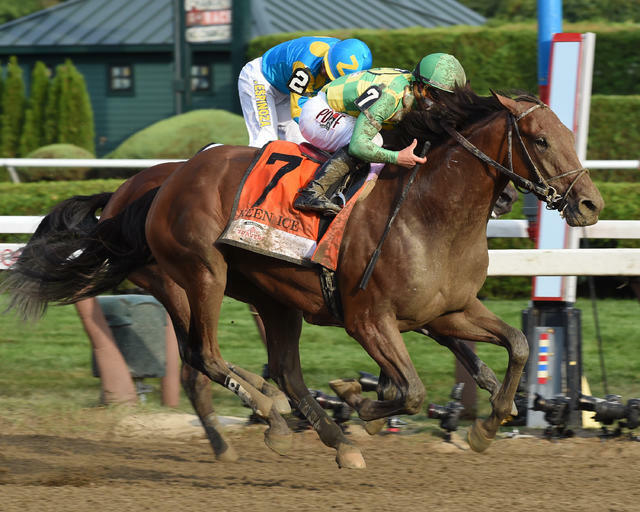 The Dale Romans-trained Keen Ice shocked the racing world in late August when he handed American Pharoah the only loss of the Triple Crown winner’s 3-year-old season in a 16-1 upset in Saratoga’s $1.6 million Travers (GI). The son of two-time Horse of the Year Curlin ran fourth to American Pharoah in a rematch in the Breeders’ Cup Classic, but he has a career record of 12-2-1-3 and earnings of $1,790,394 for Romans, the Louisville-native who saddled Preakness (GI) winner Shackleford to take the 2011 Clark. Fall Meet leading rider Corey Lanerie will bid for his first Clark Handicap triumph aboard Keen Ice, who drew the rail post and will carry 120 pounds. Odds maker Mike Battaglia has installed Keen Ice as the 3-1 second choice in his Clark morning line. Breeders’ Cup Classic runner-up Effinex, a New York-bred son of Mineshaft, is the 5-2 morning line favorite for trainer Jimmy Jerkens, who shipped his rising colt back to Kentucky in search of a similar effort in the Clark. Other highlights of the 4-year-old’s 2016 season include a win over 2014 Belmont Stakes (GI) winner Tonalist in Belmont Park’s Suburban (GII), a third-place finish to that rival in the Jockey Club Gold Cup (GI) and a victory in Aqueduct’s Excelsior (GIII). Mike Smith with ride Effinex, who has a career record 6-2-3 in 19 races and earnings of $1,812,250. He has amassed $1,466,400 of that total this year while compiling a record of 7-3-1-1. Effinex, the co-high weight at 122 pounds, starts from post eight. Defening Clark winner Hoppertunity will attempt to become the first horse to earn back-to-back victories in the race since Robert Lehmann’s Bob’s Dusty took successive runnings in 1977-78. Bob’s Dusty was trained by W.E. “Smiley” Adams, who extended his string of consecutive Clark wins to three when he saddled Lot o’ Gold to win its 1979 renewal. A win by Hoppertunity would provide Hall of Fame trainer Bob Baffert with a second consecutive Clark victory and his fourth overall, a figure that would match his Kentucky Derby win total. Baffert’s other Clark winners were 1997 Kentucky Derby winner Silver Charm, who won the 1998 Clark, and Isitingood, who took the race in 1996. Jockey Martin Garcia, who piloted Hoppertunity in his 2014 Clark victory, returns to the saddle aboard the colt for the first time since a fourth-place effort behind two-time Eclipse Award champion mare Beholder in Del Mar’s Pacific Classic (GI) on Aug. 22. The 7-2 co-third choice in the Clark, Hoppertunity will carry 121 pounds and starts in post position six. Pletcher, who has earned seven Eclipse Awards honoring him as America’s top trainer, seeks a third Clark victory with his one-two punch of Race Day and Protonico. He previously won the race with Magna Graduate (2005)and A.P. Arrow (2007). Race Day snapped a two-race losing streak when he held off Hoppertunity by three quarters of a length in the Fayette. The son of Tapit won the Oaklawn Handicap (GII) and Razorback Handicap (GIII) at Oaklawn Park early in the year, but between the Fayette and the Oaklawn successes he turned in a sixth-place run behind Bradester in Monmouth Park’s Salvator Mile (GIII) and an eighth-place finish behind Private Zone in Saratoga’s Forego (GI). 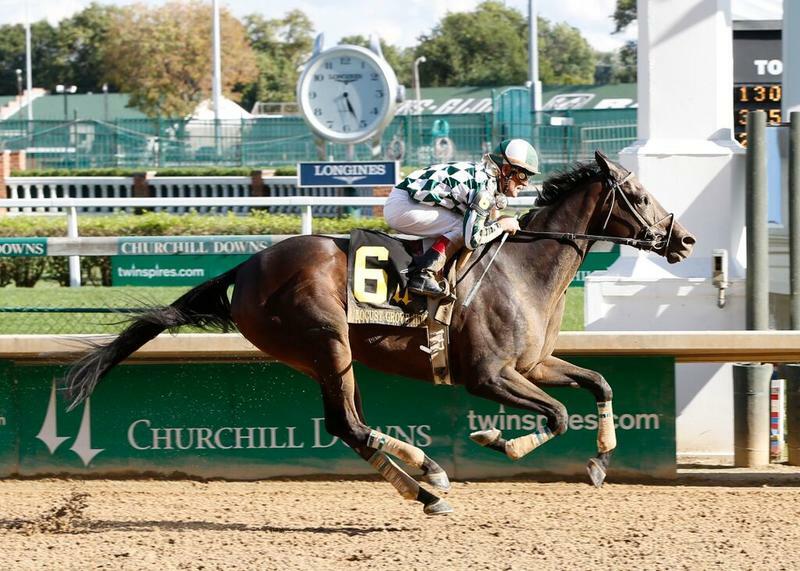 Protonico has displayed an affinity for the Churchill Downs main track, first in a runner-up effort behind Hoppertunity in the 2014 Clark and then on Kentucky Oaks Day in a narrow victory over eventual Stephen Foster Handicap (GI) winner Noble Bird in the Alysheba (GII). But the 4-year-old son of Giant’s Causeway has otherwise been erratic in 2015. He began the year by being eased in Gulfstream Park’s Donn Handicap (GI), and later ran poorly in an eighth-place finish behind eventual Breeders’ Cup Dirt Mile (GI) winner Liam’s Map in Saratoga’s Woodward (GI) and ran a dull fifth in the Fayette. John Velazquez, who won the 2011 Clark aboard eventual two-time Horse of the Year Wise Dan, will ride Race Day from post nine under co-high weight of 122 pounds. Protonico, assigned 117 pounds, breaks from gate five under Julien Leparoux, winner of the 2008 Clark on Einstein (BRZ). Race Day is the Clark’s 7-2 co-third choice, while Protonico was installed at 8-1. The most intriguing member of the Clark cast could be Frivolous, who will be its lone female entrant should trainer Vicki Oliver decide to run her in the Clark. Frivolous, a 15-1 shot in the Clark, also is entered to run on Thanksgiving Day against members of her gender in the $200,000 Falls City Handicap Presented by TwinSpires.com (GII), a race she won a year ago. The last female to win the Clark Handicap was Overbrook Farm’s Surfside, who earned the 2000 Eclipse Award for champion 3-year-old filly after defeating males in the Clark Handicap for Hall of Fame trainer D. Wayne Lukas. Frivolous has enjoyed a solid career, but her races over the main track at Churchill Downs have been among the best in her three seasons of competition. The daughter of Empire Maker has a record of 5-4-3 in 24 career outings, but her slate at Churchill Downs stands at 4-0-2 in nine races that include a 19-1 victory in the 2014 Falls City Handicap (GII), a 32-1 shocker in this year’s Fleur De Lis Handicap (GII) and an eight-length romp in the $100,000 Locust Grove during this year’s September Meet. The most recent outing for Frivolous was a solid fifth-place finish behind Stopchargingmaria in the $2 million Breeders’ Cup Distaff (GI) at Keeneland. Oliver’s mare previously ran a fourth over the Lexington track behind 1-2 finishers Got Lucky and 2014 Kentucky Oaks winner Untapable in the Grade I Spinster. Regular partner Jon Court will ride Frivolous, who has earned $750,718 in her career and would eclipse the $1 million mark with an upset victory in the Clark. Thanks to a five-pound weight allowance for a female running against males, Frivolous will carry 115 pounds should Oliver decide on the Clark as her Thanksgiving Weekend race-of-choice. Frivolous drew post four. Also entered 2015 Clark Handicap are Calumet Farm’s Lukas-trained Mr. Z, winner of the Ohio Derby and 13th in the Kentucky Derby; owner-trainer C.R. Trout’s Shotgun Cowboy, a winner of six of eight career races at Oklahoma’s Remington Park; and Looks to Spare, a one-time $5,000 claiming horse who won Mountaineer Park’s West Virginia Governor’s Cup at odds of 74-1. The field for the Clark Handicap from the rail out (with jockey, weight and morning line odds): Keen Ice (Lanerie 120, 3-1), Looks to Spare (Victor Lebron, 113, 30-1), Mr. Z (Ricardo Santana Jr., 114, 15-1), Frivolous (Court, 115, 15-1), Protonico (Leparoux, 117, 8-1), Hoppertunity (Garcia, 121, 7-2), Shotgun Cowboy (Cliff Berry, 113, 20-1), Effinex (Smith, 122, 5-2) and Race Day (Velazquez, 122, 7-2).